Despite earlier reports, the upcoming DROID RAZR HD will not feature the extended battery capacity of its RAZR MAXX counterpart. This is disappointing, as there was talk that the undisputed king of our battery life test may finally have met its match. The camera will also be of the 8MP variety – down from the 13MP mentioned earlier. Either way, the RAZR HD is quite the looker, with a full Kevlar back panel and 4.6" HD display. Inside, you'll find a Snapdragon S4 MSM8960 chipset, sporting a dual-core 1.5 GHz Krait processor and while we don't know how much internal storage the RAZR HD will have, it is set to feature a microSD card slot. 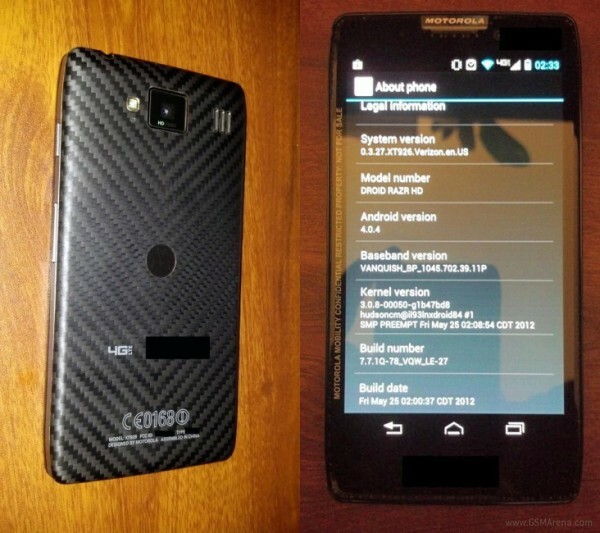 The RAZR HD will come running ICS out of box, with a Jelly Bean update rumored to come sometime in 2013. The battery included will have a respectable 2530 mAh capacity, although that's a far cry from the 3300 mAh behemoth found in the RAZR MAXX.